A new ransomware called as “Threat Finder” has been discovered by a security researcher at Rackspace. 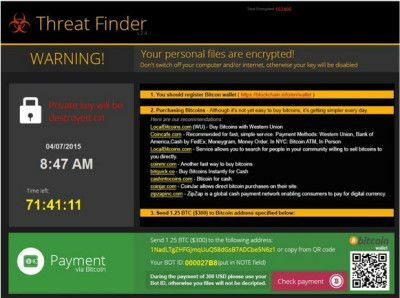 Threat Finder is feared to be a copy of Cryptolocker and can infect Windows PC’s via multiple sources; the most common infection is when a user browses a compromised website. The only solution to save your data is to take timely backups and take the usual steps to Prevent Ransomware from getting onto your computer. Are you on Server 2012? Now is the ideal time for Windows Server 2008 and Windows Server 2003 to take advantage of Microsofts latest Server platform. Server 2003 is going End of Support, what does this mean to you? • On July 14th 2015 Windows Server 2003 will no longer be supported by Microsoft. This will include Security Updates and Patches as well. • Visa and MasterCard may no longer do business with companies using Windows Server 2003 once it goes end of extended support as they won’t be compliant. If you run a Windows Server 2003 or Small Business Server 2003 now is the time to take action, The average time from business planning to completion from 2003 to an up to date O/S takes 100 days. 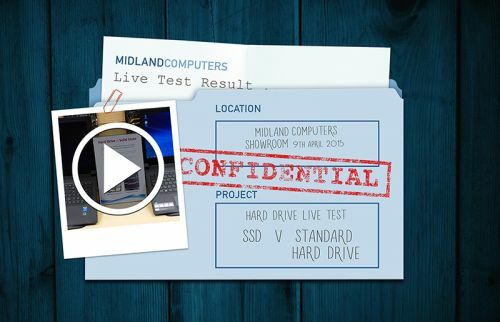 Want to see a real live test of SSD (Solid State Drive) v Normal Hard Drive? Course you do – from our showroom based on 2 x Lenovo i3 laptops, exactly the same apart from the drive.